Born in Montclair, NJ, Love earned her MFA from New York University Tisch School of the Arts and her B.F.A. from Montclair State University where she was awarded the Excellence in Choreography Award and the Outstanding Senior Award. She received The New Jersey State Council on the Arts Fellowship Grant, and the Harkness Choreographers Space Grant at SUNY Purchase. In 1997, Love was invited to The Bates Dance Festival in Maine as an Emerging Choreographer and later returned to teach for the Young Dancers Program. She was selected as a choreographer for the Choreographer/Dancer residency at the Yard on Martha’s Vineyard, recognized in Who’s Who Among American Teacher’s 2004 and 2005 and was honored as one of the “50 Women You Should Know in Montclair, NJ”. Most recently she was recognized as a “Women of Distinction” by The YWCA of Essex and West Hudson. Presently, Love is the director of the Dance Department at Hillside High School, director of the After School Dance Program for the Hillside Public Schools District and an adjunct professor at Montclair State University. She is a former faculty member in the Junior Division at The Alvin Ailey American Dance Theatre. Love is a certified Pilates Mat Instructor and a certified Yoga instructor. In 1996 Love created the Wofabe African Dance and Drum Festival. Wofabe is New Jersey’s only African dance and drum festival. The festival consists of African dance and drum classes, panel discussions, free children classes, and an evening dance concert. The festival has been presented at Newark Arts High School, Science Park High School and for the past three years the Historic Newark Symphony Hall. She traveled to Australia as a representative for the dance department of Montclair State University where she both performed and taught classes in Sydney, Melbourne and Brisbane. 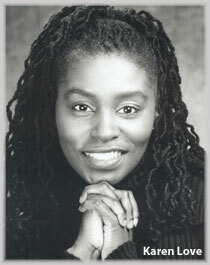 She has performed with Urban Bush Women, Gellman’s Newark Dance Theatre, and The VonHoward Project. Love has studied West African dance for the past 16 years and was awarded two consecutive Folk Artist Apprenticeships from the New Jersey State Council on the Arts to study Guinean Dance with Master Teacher M’ Bemba Bangoura. Love has traveled to Guinea, West Africa, Mexico and Bermuda under the tutelage of Bangoura. Love has traveled to Morocco, Senegal and the Gambia, West Africa under the direction of Baba Chuck Davis. Love is a former Visiting Artist in Residence at Kent State University in Ohio. Her choreography has been commissioned and presented at University of Illinois Urbana-Champaign, DTW Freshtracks, Aaron Davis Hall, The Yard, Symphony Space, Danspace, Joyce Soho, Thelma Hill Performing Arts Center, Bates Dance Festival, Duke University, Northern Illinois University, Montclair State University, NYU, and Newark Arts High School.